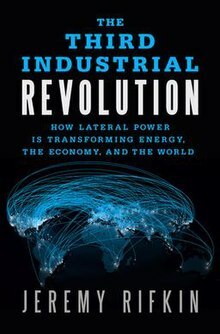 The Third Industrial Revolution; How Lateral Power is Transforming Energy, the Economy, and the World is a book by Jeremy Rifkin published in 2011. The premise of the book is that fundamental economic change occurs when new communication technologies converge with new energy regimes, mainly, renewable electricity. The Sharing economy is also explored as a crucial element of the Third Industrial Revolution. The book has been on the New York Times Best Seller List and has been translated into 19 languages. By 2013, 400,000 copies were in print in China alone. Rifkin has been interviewed on NPR. In 2017 a documentary based on the book was released by Vice Media starring Jeremy Rifkin. ^ Jeremy Rifkin, Nicolas Easley. "Jeremy Rifkin and The Third Industrial Revolution Home Page". thethirdindustrialrevolution.com. ^ "NY Times Best Seller List". NY Times. Retrieved October 23, 2011. ^ "Innovation Hub - Great Minds, Great Conversations - Recent Entries". Innovation Hub - WGBH.org Blogs. ^ "Innovation Hub - Great Minds, Great Conversations - Power to the People". Innovation Hub - WGBH.org Blogs.